Protein is an essential part of everyone’s diet, not only for its ability to aid in muscle repair and recovery, but protein helps you feel full and aids in weight loss. One of the most significant sources of protein is meat, but if you’re trying to cut back on meat, or are a vegetarian or vegan, there is a plant-based source of protein which actually possesses more grams of protein than most meats. 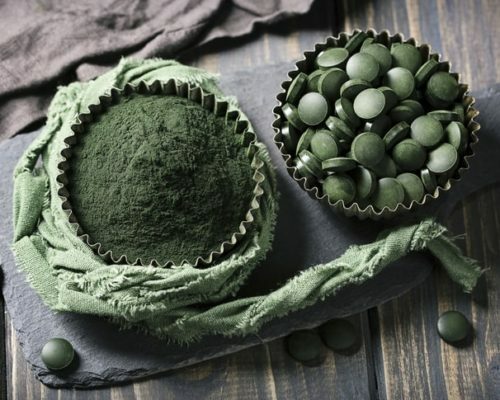 Spirulina is a nutrient-packed superfood that offers up plenty of protein. Each 100 gram serving of spirulina has 57 grams of protein. To make it even more super, spirulina is also packed with iron, vitamin B, and other essential trace minerals. Per ounce, spirulina is 65 percent protein. Spirulina can easily be added to other meals and drinks as it comes in a powder form. You should sprinkle it on your yogurt, smoothies, pesto, pancakes, and eggs. It can also be taken in capsule form. How much more protein does spirulina have than other meats? Well, 100 grams of beef only has 26 grams of protein, 100 grams of pork and chicken only contain 31 grams, and one large egg contains 6.5 grams of protein. Try bumping up your protein for breakfast by adding spirulina to your eggs. Not only does spirulina pack more protein, but it’s better absorbed from your body. In fact, spirulina protein is four times more absorbable than protein from beef. Other great vegan sources of protein include hemp seeds, organic tempeh, and soybean. Whether you’re a vegetarian or vegan, or are just looking for protein alternatives to give your body a boost, spirulina is an excellent source of protein that you can begin to easily add into your diet.